It's time for another Color Challenge and this one is full of bright and cheery colors, Grapesicle, Grape Jelly, Limelight, and Orange Fizz. 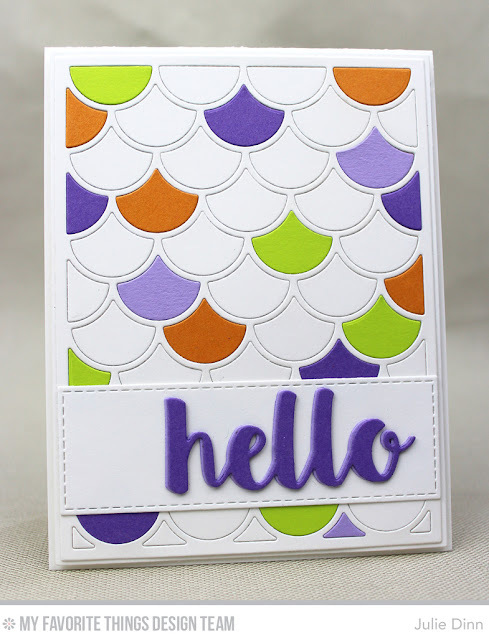 To create this card I grabbed a few of the new dies, the Dainty Scallop Cover-Up Die-namics and Hello There Die-namics. I die-cut the sentiment in Grapesicle and Grape Jelly card stock and I created a shadow by off setting the two die-cuts. What a fun card. I love those colors together and love the die too.